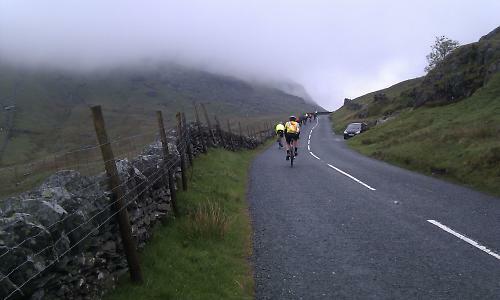 The sun was most emphatically not out at the start of 2011's Fred Whitton Challenge. Driving up to the lakes from Bath was a 250-mile windscreen wiper test, and the overnight stop in Kendal was a restless few hours to a backdrop of flashes and thunder. Driving to Coniston in the morning conditions looked more benign, but by the time the number was on the bike swathes of the horizon were erased by the kind of showers the Lakes are famous for. When they hit the event village was exactly when I planned to set off; resigned to spending the day bedraggled, I set off anyway. I was soaked about seven seconds after I'd dibbed my dibber. The stair rods seeped through my helmet, washing the salty residue from previous rides down into my eyes and mouth. Should I drink it? It's probably isotonic. Mercifully, by the time we reached Kirkstone Pass the weather had relented from biblical to brooding, and the climb was crested just a couple of hundred feet below the clouds. The descent gave some respite, and from there it's the quickest section of the course, on good roads that filter gently down into Keswick. I caught a fast moving chain gang for a few miles and then settled with a slower pace line when they spat me out. By the time I got to the Seatoller and the bottom of Honister pass, I was feeling pretty good. By the time I got to the top of Honister Pass, I was feeling decidedly less good. It's a no-holds-barred climb, steep from the start as it heads into the valley and steep again after a brief respite in the middle. Averaging 10% over its 1.5 mile length and topping out at 25%, it's a real test. I'd gone to the trouble of asking which climbs were the hard ones, but sadly I hadn't gone to the trouble of remembering, so Honister (which I'd got mixed up with the easier Whinlatter, I think) was a bit of a shock to the system. Thank goodness for SRAM Apex, eh? 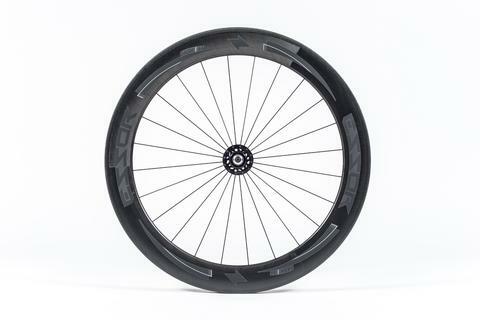 Ah, SRAM Apex. Bless you and your 32T cassette. Now I can look like a 'proper' roadie (albeit one using a compact) and still sit down and spin up vertiginous passes. It's cheating, basically. Never mind that the gaps between the lowest gears are more like chasms. I'm a convert. Down the back and into Buttermere for the first feed stop, and while I was stuffing ham sandwiches and bananas into my gaping maw the rain came again. Harder than before. I took cover under one of the gazebos but such was the force of the shower that all chat stopped; you simply couldn't be heard. We were lucky: I later learned that up on Newlands, then next pass, the rain was hail. I left when the rain eased to a deluge, and by the time I'd crested Newlands (a slog but not too bad) It had stopped. 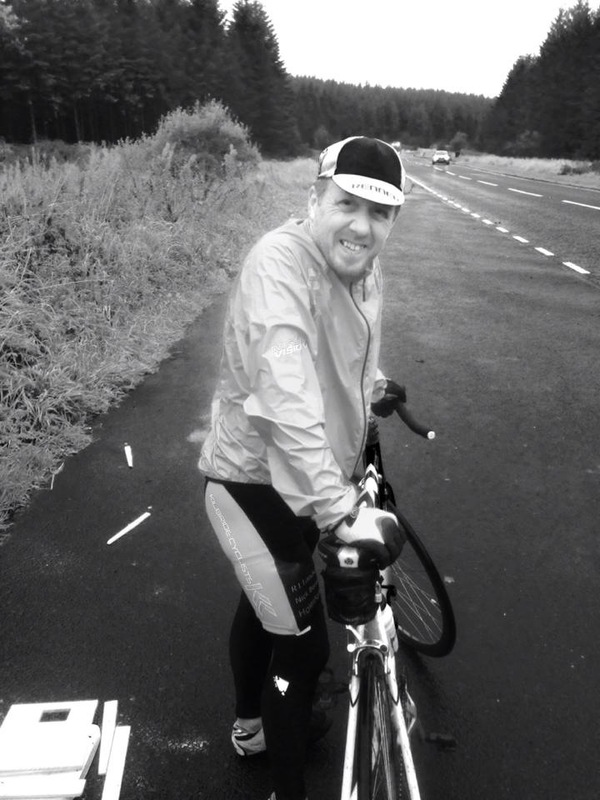 I stayed dry up Whinlatter; given that I thought it was one of the hard climbs it was a pleasant surprise. Chatting to a guy on the climb semi-prepared me for what was to come: In my simple mind, four passes down and two to go meant a nice flat section to recover. 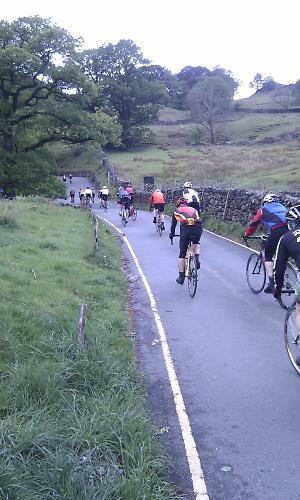 But the western section is – with the exception of Hardknott – the hardest bit of all. There's no passes to tick off but there's all manner of climbing, on a road that dips and rises all the way to the high point at Cold Fell. I'm sure it's sapping riding in the best of conditions. So it didn't help that over Whinlatter it started to rain. And then it rained and rained and rained and rained and rained and rained. And the wind blew, and the legs started to complain. 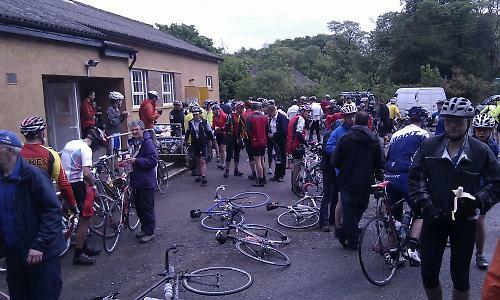 The last of the caffeine gels went down the hatch, and that just about dragged me to the second feed stop at Calderbridge, by which time the sun had appeared and raised everyone's spirits. More bananas. More sandwiches. Cake. Tea. Gels. Whatever you got. Just the final stretch to go, then, and glorious sunshine to do it in, a rolling – but rolling in a nice way – lick over to Eskdale Green, the no-turning-back point for the Hardknott Pass. The road signs make for interesting reading. "Thinking of going over Hardknott, eh? ", the basically say. "You sure about that?". It's not confidence-inspiring, but the flat run-in along the valley is a scenic preamble to the main event, with everyone lost in their own private preparations for the climb. And then you see the climb. There's plenty of reasons why Hardknott is hard. It's steep, for a start. Eye-poppingly steep. 30% at its steepest (in two places) and an average of 14% over its 1.3 mile length. Actually staying on the bike is a technical achievement, I'm sure some mountain biking experience is a major plus. There's a cattle grid to get over right at the bottom on a 25% slope – it was wet, too – so your only option is to give it some beans and hope you're carrying enough speed to make it across. The guy in front of me wasn't, but I managed to miss his head. Hardknott pretty much broke me. 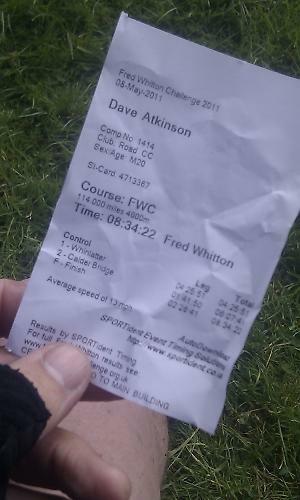 All the way round I'd been keeping a watch on my average speed, hoping that I'd break eight hours. Some time in the deluge before Cold Fell I'd realised that wasn't going to happen, but on Hardknott I entered a whole new plane of reality where time and speed had no meaning: the only thing was the climb, and the only goal the top. That achieved, the next goal was Wrynose: I knew it couldn't be as bad, because it isn't as long, or steep. But it pretty much was as bad, because I was in pieces. I had to dunk my head in one of the lakeland streams in Wrynose Bottom to get back some semblance of brain function before I started, and while I can recall every metre of the Hardknott ascent, I don't really remember Wrynose at all, I'm not sure I looked up once. 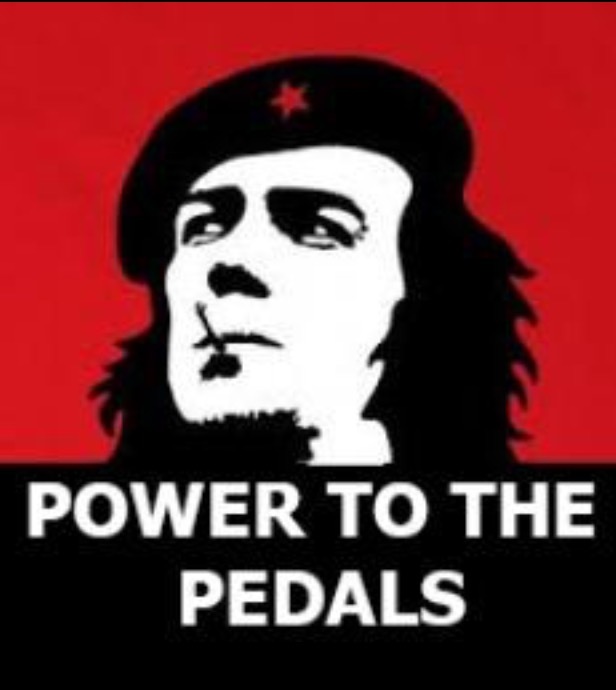 Just gazed at my front wheel and turned the pedals, head pounding. The descent off Wrynose is an exercise in not falling into a ditch, mostly. Steep and lumpy and tight and twisty. When it flattened out I assumed that we'd roll into Coniston, job done. But there's more climbing, past Little Langdale and then up to the A593 before you really are on the home stretch, ticking off the miles back to HQ. Those last five miles or so properly hurt. I was in a trance-like state. I remember being overtaken. Lots. But finish I did, and any time is a personal best first time out. 8:34 is the benchmark. Not bad for a big lad. Under eight hours is the goal, next time. Big thanks to event sponsors Saddleback for the ride invite, and also the Castelli Body Paint shorts and Vredestein Fortezza Tri Comp tryes that they armed me with for the ride; both performed admirably. Watch out for reviews on road.cc soon. so, what you're saying, is that you dabbed on Hardknott, yeah? Really great write up Dave. I enjoyed reading it from my desk..having done the ride many times in the past I feel your pain. Sure you don't fancy another go sooner than next year..?? Why wait until next year? You could arrange a four seasons road.cc challenge via the Consiton tourist office. Big respect to the big guy. From what Tony says, we're about the same size and build so 'theoretically' I could do it too. According to that sheet you're holding, you're 20 years old. Are you *quite* sure about that? 4600m in 114 miles sounds positively bestial. Well done that chap. Brake blocks replaced: we ran out!!! Dave, great report and a much better time than I managed on my first go this year (9:17) Harknott beat me up, just after cattle grid the guy in front of me came down causing a cascade of stops and from then on a number of walking cyclists. He apologised profusely to all but no one minded at that time it looked like less than 10% of those on the hill were acually riding. Rode the flatter (!?!) middle section but got caught by the first hairpin and off again. Similarly on Wrynose being passed by within inches by a 4X4 caused more walking but didn't care as I was making it in under 10hrs which had been the goal. It is truly an excellent event and the support from the local populace is phenomenal. Thoughts now turn to gearing the trike down for those pesky climbs, though it may be the horrendous descents that cause more of an issue. Dave, we. salute you! Well done and great account! It went very well considering the weather and the 'offs', one of our team hit a puddle, which had a pot hole in and did himself and his bike a big diservice... all of which was around 5 miles from the start! I'll obviously say this: There's so much that goes on behind the scenes on this event, the setting up of the tents, the setting up of the coniston sports centre, the cooking of the foods, the dibbers, the times, the certificates, the POLICE... and then the taking down of the tents... the lakes road club start to plan for the following years event a few days after the one just taken place! It's a real credit to Fred's memory, and Lofty is very much in his element! It gives me great pride to say that i have done the 'blardy' thing 4 or 5 times now, i loose track, a bit like you on wrynose Dave, but even more pride to be part of the club and have "hardcu*t" as it's locally reffered to on my back door as a sunday club run... If we're brave enough! See you all next year, i'll be riding it! Nice one Dave. I've attempted Hardknott. I was camping with the family in Boot, had looked at the pass the day before by car and thought 'Let's have it!' Next morning like an idiot on a 39/26 the front wheel was lifting off the ground on only the second bend after the cattle grid and the rest of the climb was a lesson in personal humiliation. Luckily it was early in the morning so I had to whip my map out just once. You know, the trick of pretending to a passing car that you've casually stopped to consult the route options when really you've ground to a painful halt? I now have a 34/29 which may, possibly, make it. 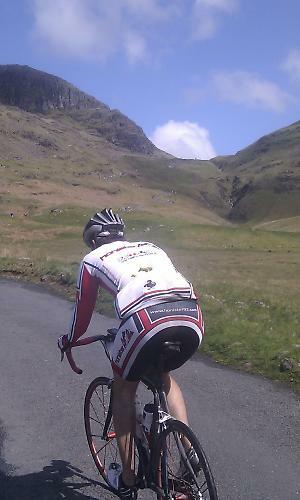 I'd love to see pro riders on Hardknott. Alberto wouldn't be dancing up that on a 39/25! In 1996, I set out to tackle Hardknott from the East, turning a 42x21 lowest gear. Needless to say I couldn't get over Wrynose first!